Mr. Megel has spent the last 20 years focusing on the direction and development of new works, for theatre, film and video. Mr. Megel is a member of SSDC (Society of Stage Directors and Choreographers), Co-Artistic Director of in Chapel Hill, North Carolina, and an Associate Artist for The Working Theatre in New York. He holds the M.F.A. degree from the Peter Stark Motion Picture Producing Program at the University of Southern California, a Master of Arts from the University of Cincinnati’s College Conservatory of Music and a B.S. in Speech from Northwestern University. He served for six years as Artistic Director of Playwrights Theatre of New Jersey, a new play development theatre, and continues to serve as Co-Executive Producer of Harland’s Creek Productions, producer of New York premieres of new plays, developmental producer of screenplays, readings and films. 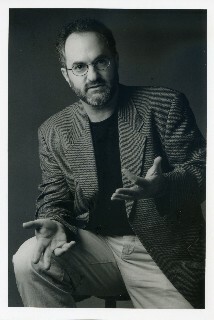 Joseph Megel directed Guillermo Reyes’s Men on the Verge of a His-Panic Breakdown in its Off-Broadway production at the 47th Street Theatre (Outer Critics Circle Award); in Los Angeles (Best Director Ovation Award Nomination; Best Production Award Winner); San Francisco; San Jose and elsewhere. Recent credits include the direction of Men on the Verge II- The Self Esteem Files by Guillermo Reyes at Borderlands Theatre in Tucson, Arizona and for the National New Play Network: Free Market for the Working Theatre; Voodoo Dreams for the Institute of the Performing Arts (Most Innovative Production Arizona Republic); the New York premiere of Jim Grimsley’s The Lizard of Tarsus; an Off-Off Broadway revival of Athol Fugard’s The Blood Knot at the 78th Street Lab; Dolores Whiskeyman’s Radium Girls (Star Ledger 1999-2000 Best Play) and Guillermo Reyes’s The Seductions of Johnny Diego at Arizona State University (Best Production Zoni Award). One of the plays he most recently developed, with the playwright, Jennifer Maisel’s The Last Seder, won the Kennedy Center’s Fund for New American Plays production grant, as well as The National Foundation for Jewish Culture’s new Jewish Play Commission grant. He directed The Last Seder at the Organic Theater in Chicago in April 2002 and at Theatre J in Washington D.C. in January 2003, as well as readings in Los Angeles, Washington D.C. (Kennedy Center), and New York. In the last three seasons he has also directed regularly at StreetSigns, including Eric Rosen’s adaptation of Jim Grimsley’s Dream Boy, Grimsley’s White People, Elisabeth Lewis Corley’s new adaptation of Moliere’s The Miser, Shakespeare’s R&J, the North American premiere of Naomi Ragen’s Women’s Minyan, and the world premiere of Jeanmarie Williams’s Vanishing Marion and at Manbites Dog in Durham, North Carolina, including an original and a revived award-winning production of Nixon’s Nixon and The Last Two Minutes of the Complete Works of Henrik Ibsen. In November he is slated to direct Albee’s The Goat or, Who is Sylvia at Man Bites. He served Mill Mountain Theatre in Roanoke, Virginia as dramaturg for its new play festival; Burning Coal Theatre in Raleigh, North Carolina as director of new play development and was a Distinguished Visiting Artist at the Virginia Piper Center for Creative Writing at Arizona State University. He also recently served as a screenplay mentor/dramaturg at the O’Neill summer conference. In Los Angeles, Mr. Megel was co-founder and artistic director of A Renegade Theatre Ensemble and Words Across Cultures, where he directed over forty productions including his own adaptations of works by Isaac Bashevis Singer and Richard Brautigan. Also in Los Angeles, Mr. Megel was co-owner of Brave New Media, a film and video production company. In Los Angeles, his direction received three Drama-Logue Awards, a nomination for the NAACP Theatre Award, an Ovation award nomination and a special commendation from Mayor Bradley. For the past three years, Mr. Megel has been teaching as a visiting artist in Performance Studies at the University of North Carolina at Chapel Hill and in the last year also serving as a visiting artist at Georgetown University in new play development and as a director in their new political (Gritti Politti) summer performance festival at Georgetown University. In the fall of 2006 he will also be teaching screenwriting at Emory University in Atlanta. Previously he was a visiting assistant professor in the graduate playwrighting department at the University of Nevada at Las Vegas and has been a visiting artist and teacher at University of Virginia in Charlottesville and Arizona State University. He is also a long-term teacher of screenwriting both in workshops and as a coach for individual clients, including a New Century Award winner. He works as developmental director of screenplay readings for private clients, including a reading at Merchant Ivory Productions, and has assisted with original screenplays and adaptations of novels and memoirs by award-winning authors including the Lila Wallace-Readers Digest Fund Writer’s Award, the Penn Albrand Award, and a finalist for the PEN/Hemmingway award.